An orphan grapples with her unpleasant aunt and the even more unpleasant idea of moving to Boston in this poignant middle-grade debut that handles loss and renewal. Donut is an eleven-year old geography buff who keeps her taxidermied mice hidden in her late mother’s hope chest. Her pops passed away, leaving her an orphan. Aunt Agnes has moved in, bringing along her lumpy oatmeal, knitting, and a plan to drag Donut off to Boston forever. Donut stands to lose everything: her friends, her village, her home, the woods, and walks where the memories of her pops are stored up. While Donut dodges the ache of missing her pops, she and her best friend Tiny plan how to keep her where she belongs. 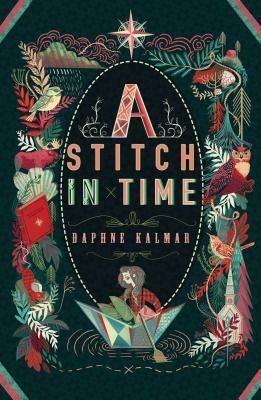 A Stitch in Time by Daphne Kalmar is shot through with gorgeous, evocative language, and gets right to Donut’s heart. Daphne Kalmar was an elementary and middle-school teacher for over twenty years. Exploring the natural world with kids was her passion as an educator—she owned seventy-five pairs of rubber boots so she could outfit each new class in September and lead weekly expeditions to local creeks and ponds. She has an MFA from Vermont College of Fine Arts. A Stitch in Time is her debut.